After our lovely time in Edinburgh Mom, Grandma and I made our way to Paris. I was feeling a little under the weather due to the copious amounts of beer and whiskey consumed the night before but excited to see the City of Light again. Having lived in France for 5 months, I have visited Paris multiple times. The first time I went, me and my exchange friends Caleb, Mackenzie, Veronica and Joakim accidentally got on the wrong train when we were trying to get home to Lille from Brussels. We were all just excited to get home after a weekend of partying in Belgium but ended up embracing our fate and checking out the city for the day. This trip was much better planned. 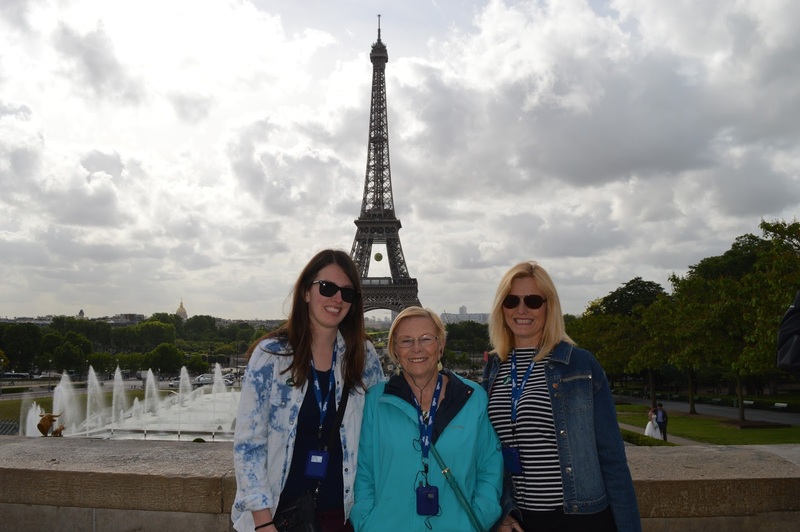 Grandma and Mom have wanted to go to France for a long time and I was happy to join them and be an amateur guide. I also had the chance to meet up with my besties Brianna, Donya and Bryan who were traveling Europe. It was a whirlwind. We fit so much into 3 days it’s unbelievable. Being that this was probably going to be the only time she would visit Paris and that we only had a couple of days there, Grandma wanted to stay right in the thick of it and get the true Paris experience. We arranged a gorgeous Airbnb right near the Louvre that had a cafe on either side of the front door. The downside was that we had to climb 4 flights of stairs to get to the apartment. Being an excellent granddaughter, I volunteered to carry the suitcases up the stairs, resulting in me dropping the suitcases once we were in the apartment and getting a black toe that lasted for months. The views of the streets of Paris were worth it, though. Wanting a quiet night of cheese and wine, Grandma and Mom decided to stay in while I went out to meet my friends for dinner. So, I ventured out into Paris, brushing up on my french and on my metro skills. It was great to see Brianna, Donya and Bryan after 6 months and it was funny to hear Donya and Bryan’s stories of their first few days in Europe. Neither of them had ever been before and it was interesting seeing it from a new comer’s perspective again. We ate near the Gare de Lyon because Brianna had to leave after dinner. At the restaurant, I ordered the French classic of Moules et Frites or Mussels and Fries and it was delicious as expected. 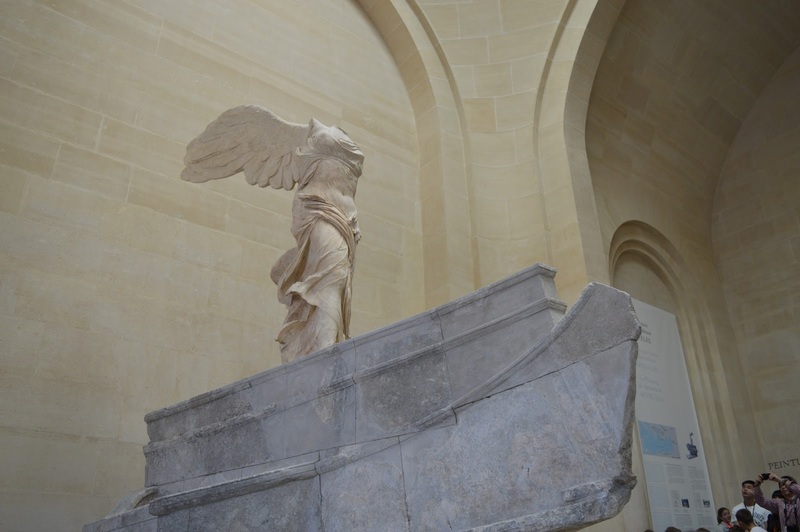 Afterward, we parted ways with Brianna and, as it started to rain, Donya, Bryan and I made our way, armed with a bottle of red wine, to the Louvre. Now, in the Woody Allen movie Midnight in Paris Owen Wilson’s character Gil says at the beginning that, “Paris is most beautiful in the rain.” Before this night I probably would have disagreed with this as there is nothing like a clear sunny day in Paris, however, we decided to embrace the rain that night and it led to us having a lovely time. Because it was raining the courtyard of the Louvre, which is usually infested with tourists, was completely empty. We had the place all to ourselves and sat watching the as rain sparkled in the lights of the famous glass pyramids until we had finished our bottle and it was time to part ways. The next day the rain had cleared and sunny skies prevailed as Mom, Grandma and I headed out to do some serious sightseeing. Our first stop: the Eiffel Tower. It’s an obvious sight to see and I would say completely worth it. 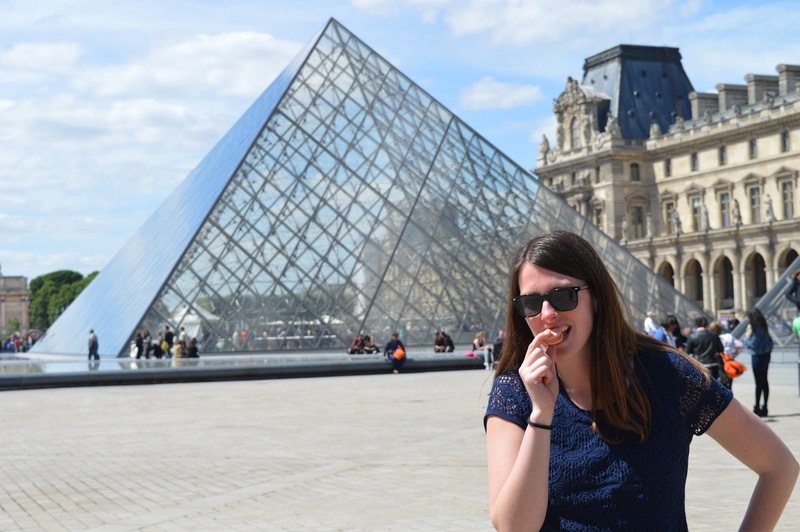 You can’t not go to if it is your first time in Paris. Mom had arranged a tour in which we got some history of the tower and we also got to skip the lines and make our way up the structure and get those endless views of the city. 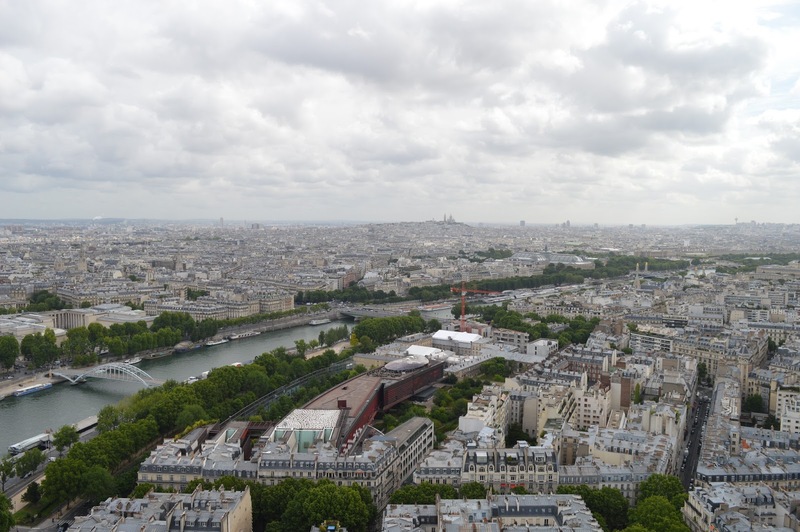 Even though I had been to Paris many times, I had never actually been up the Tower so this was a real treat. One of my favourite facts about the tower is that a lot of people hated it when it was first built. People thought it was a huge eye sore. 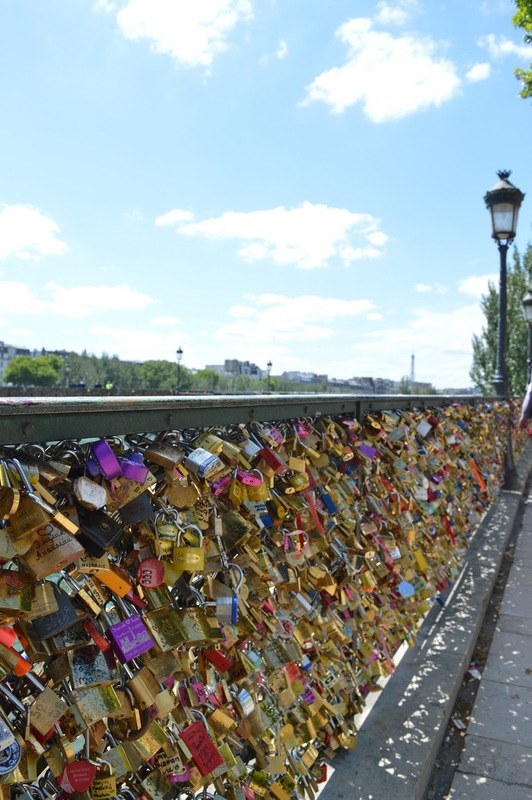 Now it’s one of the most famous and romantic structures in the world and a symbol of a city that once hated it! Also, the fact that the Eiffel tower is painted is something I never thought of before. Seeing as all of the early pictures of the Eiffel tower are black and white I had never thought it was ever another colour. It was though! It has been multiple shades of red and even yellow before it was painted the more brown or bronze colour of today. Apparently, they have to paint it every 7 years. I can’t imagine what it would look like if it was yellow, to be honest and I hope they stick to neutrals from now on. 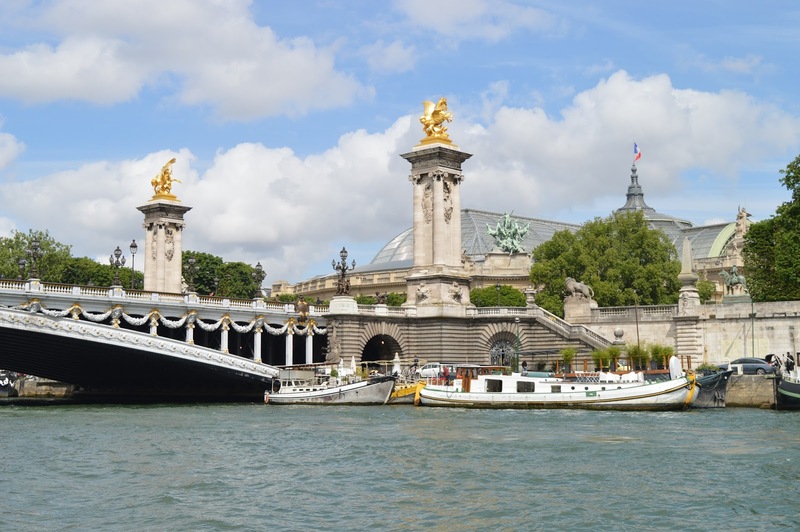 After our tour, we then got to go on a boat cruise on the Seine. This is also something I have never done before so I was thankful I had the chance to tag along with Mom and Grandma on this trip. 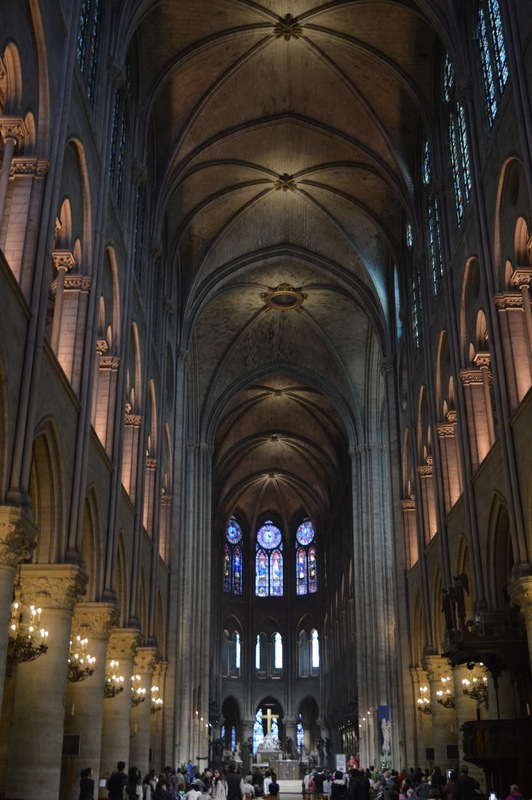 We got to see many of the landmarks of Paris from the famous river such as the Notre Dame and heard some more history as well. 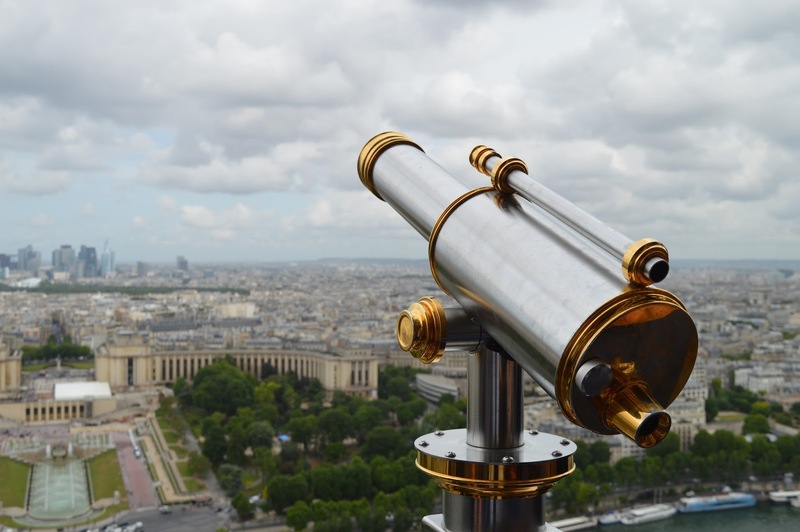 I’ve heard a lot of people say they were disappointed with trips to Paris because they had expected so much. I’ve even heard that in some countries they have psychiatrists that specialize in helping people deal with their disappointment upon returning home from Paris. People put it on a pedestal and expect magic when they go there. What they don’t realize is that Paris is still a city and has people and problems just like every other city. I think that if you go into it with an open mind and take your time to relax and appreciate what it is which is full of beautiful architecture, museums overflowing with art, inexpensive wine, delicious pastries, and full of history then you will enjoy it immensely. It is a big city and sometimes you have to get on a stinky metro but this is life. 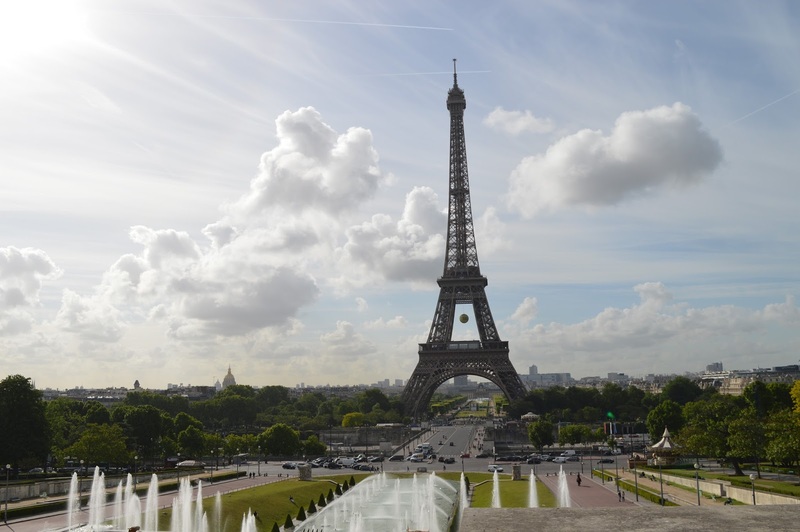 Also, the size is deceiving and even though it may look like the Eiffel tower is just a short walk away take the metro to save time and sore feet. But I digress. After our boat tour, we had lunch at a cafe and bought some macarons before doing some more sightseeing. We also got hop-on op-off bus passes so we used those to get around and see parts of Paris easily that we otherwise might have missed. If you’re only in Paris for a few days, I would recommend doing this as it’s easy and convenient. 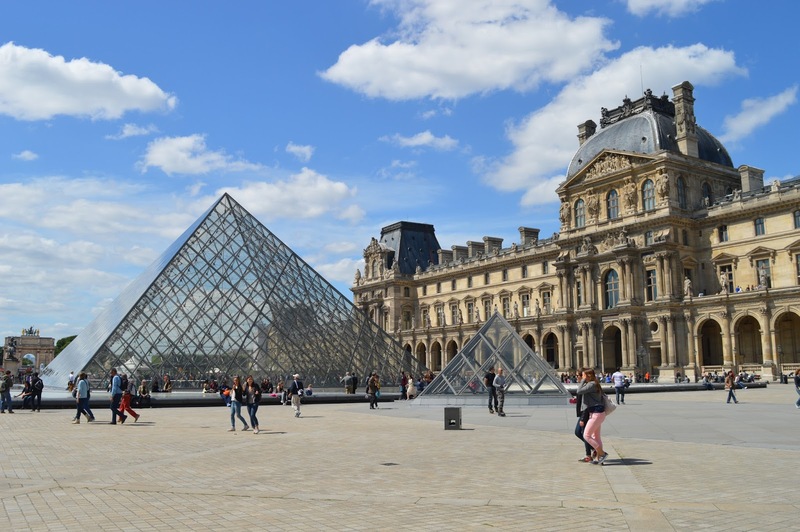 We got off the bus at the Louvre where Grandma and I went in and saw some of the amazing art work it holds including the ridiculously popular Mona Lisa. The popularity of this painting boggles my mind. There are so many other paintings in the Louvre worth as much hype and admiration, there are even other DaVinci works worth looking at, and yet many people breeze by those for a small painting of a woman. The power of a mysterious smile I tell ya. The first time I had seen the Mona Lisa I was one of three people there because the museum was close to closing. This time, however, we experienced the mayhem and, honestly, the actions of the people were probably more entertaining than the painting itself. The number of selfie sticks in that room was just ridiculous. 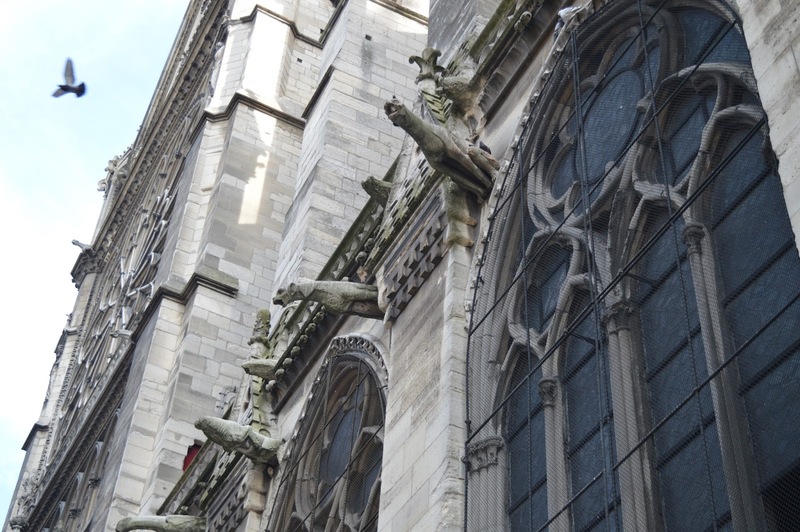 Needless to say, we didn’t stay long and moved on to other parts of the museum before meeting Mom outside and heading to Notre Dame and it’s beautiful stained glass windows and ugly but intriguing gargoyles. 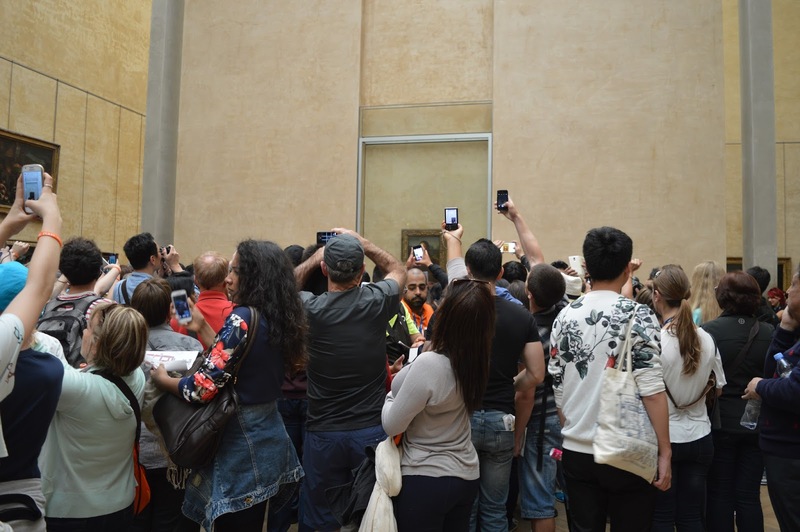 Is that the Mona Lisa or a group of crazy people? Across the street from the church is a bookstore called Shakespeare and Company. I had been to this bookstore before but insisted that we go back. Filled with English and French books, this bookstore is a charming tribute to the writers and artists that called Paris home in the 1920s. Obsessed with the 1920s as I am, I now have two books by Ernest Hemingway and a copy of the Great Gatsby, contributing to my library while being souvenirs with value. We then meandered our way to a restaurant called L’auberge de la Reine Blanche for dinner. 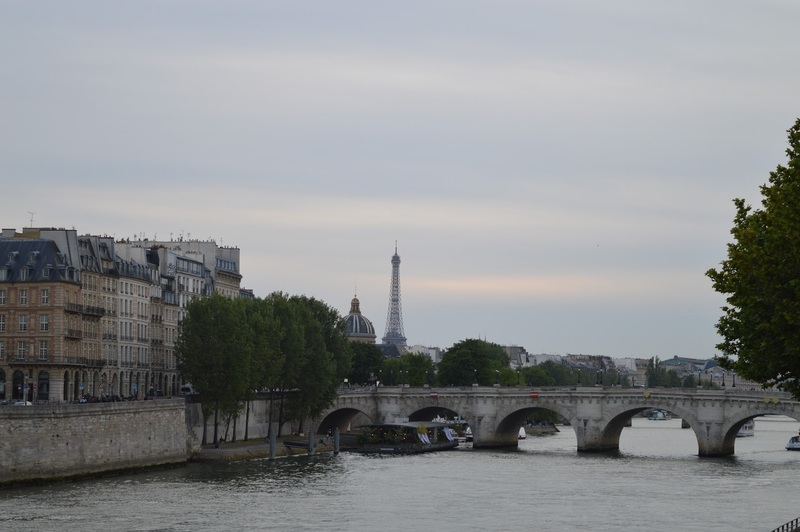 The restaurant was a short walk from Notre Dame and on a quaint street near Pont Marie. It had charming decor and atmosphere and delicious food. I had a French Onion Soup that makes my mouth water thinking about it to this day. That night I left Mom and Grandma exhausted at home and joined Bryan and Donya at the Jardins du Trocadero for more wine and to watch the Eiffel tower light up at night. The Eiffel tower literally sparkles as it puts on a show every hour, proving that Paris deserves to be called the City of Light. It was the best end to a great day I could have imagined. For our last day, we let Grandma go off and explore another art museum while Mom and I had a classic French breakfast in one of the neighbouring cafes. We then made our way to the Louvre gardens aka the Jardins des Tuileries where we soaked up the sun and had a picnic and wine by the fountain. We then said goodbye to Paris and made our way to the train station to head back to London. In retrospect, it’s amazing we did everything we did in the short amount of time we had in Paris. I think Grandma could have stayed there for weeks and have been happy but she was glad she made it there at all. For both of them, I think it was a dream come true and I’m just happy I could be a part of it. It really was a fantastic end to their visit to Europe. For me, it was back to reality and back to school but still more fun things were to come while I lived there. I was featured on my friends blog! Since London: The Rest of 2015.